Last year I decided to add contributors to Made By Girl blog & so glad I did! These talented ladies contributed many interesting posts as most of you may have seen! So, it's that time again to switch out a few of the contributors & bring in new FRESH FACES & posts! I'm even busier managing my MBG Shop, painting for my Cocoa & Hearts site, marketing, answering email & maintaining my personal life. 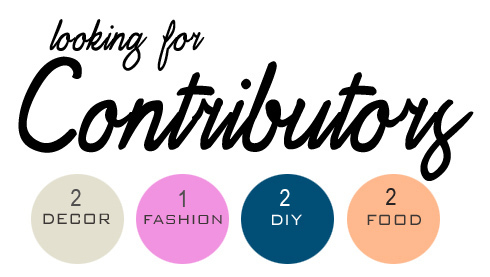 It's STILL a lot of work, so I'm searching for my next contributors! Below I've outlined more details & what I'm looking for. 1-2x per month for 6 months. Not at this time. But it's a great chance to gain more exposure and collaborate with MBG blog. We'll be adding a page with photos & short bios of all the current contributors . Yes - Must have an active/updated blog. It's very important to credit all images. I love pretty & interesting posts. So pls put some LOVE into it! I'm looking for bloggers who have some knowledge of programs like Photoshop & have a similar sense of style as Made By Girl. The posts you write for MBG cannot be posted on your own blog, but you can link to it from your blog. & let me know which category you're interested in. Write 'Contributors' in the email subject pls. ALSO, pls email me your blog so I can see your style! If you submitted last yr. don't be afraid to submit again! If you don't hear from someone at Made By Girl in about 2-3 weeks from this post, it means someone else was selected. Unfortunately, we may not be able to respond to everyone. I'll post those that are selected in an upcoming post!